If you have loose adult teeth that are useless, there are many tooth replacement options available. Restoration methods for a single tooth include removable partial dentures, dental bridges, and dental implants. The experienced doctors at Lightfoot Center for Laser Periodontics recommend dental implants for the closest replication and function of your original, natural teeth. While removable partials and fixed dental bridges may be successful alternatives, most times dental implants offer greater benefits to our patients who are concerned about loose adult teeth. With single tooth dental implants, a titanium post placed in the jaw bone serves as your tooth root while the abutment, or connector, rises up from the gum line to allow the crown to be the same positioning as your other teeth as well as a stable, permanent hold. Another method includes a screw-retained crown where the crown is secured to the actual implant itself. Removable partial dentures consist of an artificial tooth attached to a metal and plastic foundation manufactured in the color of natural gums. These are removable solutions for your loose adult teeth and must be attached to your existing teeth with metal clasps. Most patients are not satisfied with the look or feel of this prosthetic. Dental implants are permanent. They stay securely in your mouth, becoming a part of you. There are no visible metal portions, and no one will notice the difference between dental implants and your own natural teeth. Three unit bridges are a permanent, fixed solution for loose adult teeth that are comprised of three crown units. The center crown spans the space of the missing teeth while the end crowns anchor the dental bridge in place. 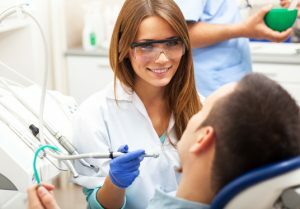 The disadvantage of this method is that your healthy natural teeth on either side of the space must be ground down to accommodate the crowns, which puts you at higher risk for needing a root canal on these teeth in the future. Dental implants do not require any alteration to your healthy natural teeth – a more conservative option! Call your periodontist in Hingham, MA for dental implants to save your loose adult teeth.